Thank you. This has been a very interesting to me too as I travel a rather difficult route. I think most of the learning curve of the printing and drawing has been traveled. Though I wouldn't consider myself an expert in ether disciplines I think I know that I've learned what I need to in order to build this model. Now it's just a matter of adjusting the details to get the quality I want. I have a third brass test coming (in the mail) along with the final Sizing test frame in FUD. If everything checks out and the brass remains predictable and I can successfully blind a driver, then all that is left is a little detailing. Hope to be assembling brass pieces by July 1st. The purpose of this test was to determine how much shrinkage their would be between the axle slots and if boiler bands can be satisfactorily modeled in brass. Above see the results the actual measurements being written on the drawing. Both prints look very good indeed and there was no shrinkage between the axle slots on ether prints. This is telling me that the brass print/casting process can give me the detail I need in the boiler. I don't need to use fUD over a brass support inner. I can have a thick brass model boiler that will have the needed detail and the needed freight. I also printed a frame in fUD with a few changes. A little more careful scaling showed that the middle driver still needs to be blinded but there should be enough room for the drivers. A few little changes in the frame and once I blind the center driver and confirm that they fit then I'll be ready to print the frame in Brass. Bob, nice going and it's been fun following along. That is some progress Bob! I'm very keen on seeing how the boiler will come out in brass. The test piece looks very promising. Looks like you are on track for success. I like all the detail you have put into the frame. I�m really interested in your frame project, since it is for a favorite prototype of mine, but also for your journey up the learning curve of Sketchup and 3D printing. This is clearly the way of the future for getting those specialized parts no regular manufacturer is ever likely to produce. I can think of a couple of things to check on your frame, if you haven�t already done so, but nothing really major since it looks like you�re doing all the right things to get a good frame in brass the first time. I think it would be useful to check the squareness of the axle slots to the frame. Easy to do with a length of axle stock and a square. If you have two lengths of axle stock you can check the parallelism of the slots. And this will also give you a very accurate measurement of the axle spacing which you will need when it comes time to make siderods. Another check to make would be to put an axle in the slot and check its fit with a cover plate in place. Of course this is something you can always touch up with a file on the brass frame, but it would be helpful to get it close first. The usefulness of these checks depend on how good a predictor the FUD frame will be of the brass frame, but from what you have already posted, it looks like it will be very good. I doubt whether any of it will be a problem, it just never hurts to check. I then just added more details, and supports to this frame. The Ash pan,firebox and springs where all separate components that were draw once and then copied and mirrored and moved into place. It's a fun Challenging project. The lazy and cowards need not apply. There's still a little work left here. I need to add hand rail stations and I'm not sure that the tapered portion of the boiler is thick enough. You might note a basic change in my design too. I've listened to the suggestion of Don Ball and moved the motor to the tender. This will allow for more weight on the drivers and a little larger, slower RPM motor leaving enough room in the tender for the decoder and speaker. Just a little footnote to the above. I scaled my drawing and printed it out and it's a perfect fit over the Scale Drawing that I'm using for reference! Looks real. I'm interested in seeing how it turns out, especially the taper in the boiler. That alone makes 3-D printing worth the effort. Believe it or not I've popped into thread and lurked just to see how you were progressing. Have to say I'm quite impressed with your progress. I just read from the beginning of where you started this project. My comment on the blind driver. Heat build up isn't a worry. You are not removing much material at one time. Since the driver has a plastic center supporting the brass rim, the whole driver would be more of a worry. There is a method for doing something like that. A fixture to hold the driver would be in order. Also John Bopp's comment about the axle's fitting in square on the frame is an issue that may need addressing. As he suggested using long rods in the journal bearings will tell how square the frame will be printed. I've followed a British forum where members build up locomotive frames from brass etches and they have ways to making sure the journals are square with the frame. I need to find an example picture and link to here. I'll also be following this build much closer now since I've also wanted to build a 2-6-0, only in TT scale. I won't be using a printed frame since the frame sides will need to be .020" (.5mm) or less in thickness. Since Shapeways can't do less than 1mm and since the scale is TT weight and size would be an issue. I'll be using a method the Britt's use for making loco frames. I may be interested in a solid boiler in TT if it could be scaled down to TT size for a template to make a brass TT scale boiler. So keep up the great work. I'll be popping on this thread more often to see how you're progressing. Here's the information I was talking about for making sure the journal boxes are square and level with the frame. This British modelers explains it very easily. Scroll down half way, under the subject of "Continuous Spring Beams", for pictures and explanation of his method. One more thing on the frame. Unless I misunderstood, your plan is to have the axles run in the frame slots as cast, with maybe a little touch up with a file. That is, you aren�t planning to leave stock on the working surfaces for finish machining. This seems like a good way to go and one that should really take advantage of the capabilities 3D printing is supposed to have. But I would suggest you make one more check. 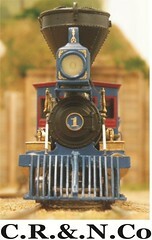 You mentioned that you are making the frame in brass so the loco can be a runner. If so, I think it would be worthwhile to check how well the axles run in their slots. There should be good contact between the axles and the entire bearing surfaces that you have in your design. If not, if, for instance, the axles only run in a narrow band at the edge of the frame, the frame will wear quickly until the axles fully bed in. This kind of wear might adversely affect the loco�s performance. I�m not suggesting this will actually happen, only that with this frame being a journey into somewhat unknown territory it would be a good thing to check, just in case. And I also don�t mean to imply that you haven�t thought of these things, only that it would be good to verify that you are actually getting what is in your design.